Saturday afternoon Clemson added to their 2020 recruiting class picking up the top safety prospect in the country, RJ Mickens. 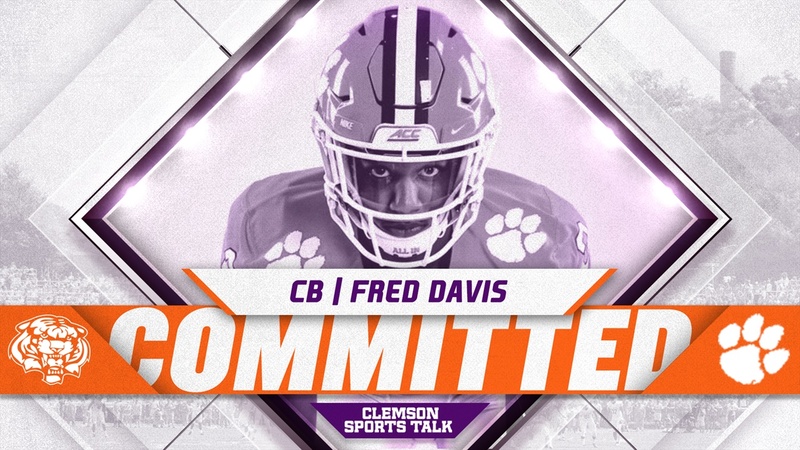 Tonight, the Tigers continued to build their secondary of the future, as five-star cornerback Fred Davis‍ committed to Clemson over Alabama, Auburn, Florida, Miami, and Ohio State. Davis, a 6’2”, 175-pound corner from Jacksonville, Florida, picked up a Clemson offer in December and the Tigers quickly became the prohibitive favorite for his services. Davis was on hand for Clemson’s spring game Saturday, making the Tigers his final visit before rendering his decision. Davis noted Coach Venables and Coach Reed as a major reason that he decided to join the Clemson program. He plans to enroll early and arrive on campus in December. Davis also mentioned the educational experiences offered at Clemson and the rising senior was excited about the opportunity to take on new challenges in college. “It was good because they’ve (Clemson) got different programs and internships...the P.A.W. Journey,” Davis noted. Davis was asked if he was going to be recruiting other top prospects to Clemson and if he would tell who they were. Davis joins what’s quickly becoming one of the top classes in the nation, as he’s the 11th player to commit to Clemson in the 2020 class. All eleven prospects are rated four-stars or better by different recruiting services. One interesting note that came out of the interview was when Davis recalled Alabama being his “dream school” as a child. The Crimson Tide offered Davis first as well, but in the end, Clemson’s culture was too hard to pass up. Davis said that after he told Coach Swinney that he was committing this weekend, the national-championship winning coach soaked it all in for a moment and then explained what being truly committed means. We’ll have more on Davis’ decision later in the week.